Rig is looking good RichardM! Your temps still seem so chilly, but I bet it felt downright balmy to you. Hopefully the 300's will be imported before ant kind of tariff's can be imposed on euro bikes. Fingers crossed anyway. And all because of a proposed beef tariff I believe. That makes about 35°C less than we had today, Richard. But I have to admit, the white stuff and the blue skies are a good match for your rig. The ideal situation for us is warm weather followed by several days of snow. That may wipe out some of the mosquitoes! As expected, I was the only thing there with handlebars. 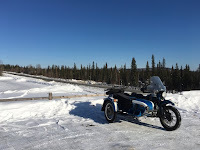 They asked me to give them a warning when I was ready to "peel out" and I told him that Urals can't "peel out". Haha, that certainly made me smile! Nice weather! I'm sure that felt little very. You must be a strong man to leave without any of the yummy sounding treats. Very nice weather. I made a point of bidding on things but not going back to raise my bids. Sunny day, food, what more could you ask for! The cookies you contributed sounded heavenly. 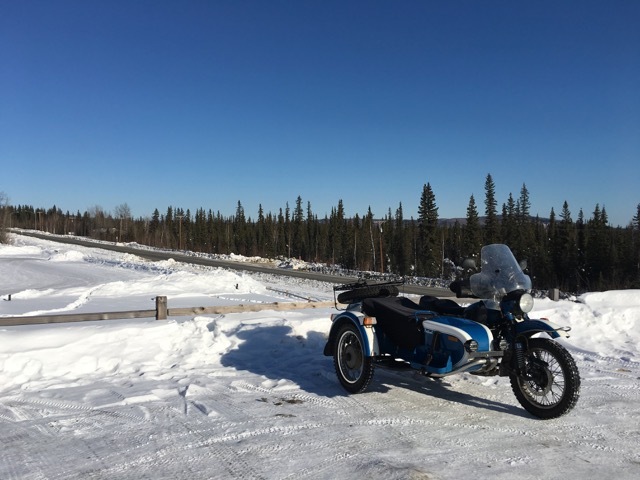 Wow, it's unusual to see someone riding on our Urals in Alaska.